Site owner can also make a few bux because OpnPress theme has built in deposit system which works with PayPal. It’s up to you to decide whether user submissions are free or require certain fee. Either way, it’s very easy to set it up from theme Options page included in Admin panel. 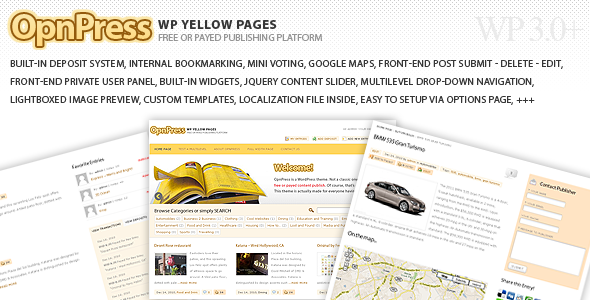 This theme can be used for more than just one purpose; article submission, yellow pages, classified ads, Q and A, reviews, press releases, file sharing, real estate listing, websites showcase, etc, etc. You can literally build community website that fits to any niche. Extensive settings options, built-in mini voting system, internal bookmarking, google maps, support for widgets, deposit system with transactions overview for each user, front-end posting and many, many more make this WordPress theme really unique. Once installed, it’s not going to take more than 15 minutes to make it ready and running, I can guarantee that for sure. Share the post "Sofa OpnPress – Publishing Platform"